A day on the water in a former rum runner. The 77-foot schooner Atabeyra offers visitors and residents a taste of TCI paradise. It’s not every day you’re given the opportunity to sail on a rum runner in the Turks & Caicos Islands. The mere thought of hopping aboard a 77-foot schooner in the heart of the Caribbean’s bluest waters conjures images right out of a Johnny Depp movie. On a brilliant Sunday afternoon in Providenciales, twelve adventurous souls did exactly that when they took off on Dave Douglas’ Atabeyra for a four-hour tour. When Dave Douglas moved from the Bahamas to Providenciales in 1992, he began hauling rum, beer, and who knows what else between Turks & Caicos and the Dominican Republic. After keeping a close eye on the surging Providenciales tourist trade, Douglas christened Sun Charters tours in 1998 and started transporting wide-eyed tourists on sailing excursions full-time. For the well-traveled sailor, the Atabeyra is a boat he and his wife Jenny literally built with their bare hands. The schooner’s two towering masts came from pine trees grown in the forest just outside the Douglas’s former New Orleans home. Today’s version of the Douglas’s sailing business is running full speed ahead. 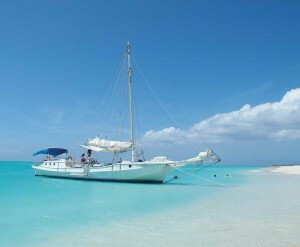 On most days during TCI’s high season of November through June, the Atabeyra sails twice per day. Its crew of Tibi Gula and Junior Relis operate half-day snorkeling tours, sunset cruises, and private charters. Twice a month and three days after a full moon, Sun Charters also offers an excursion dubbed the Glow Worm Sunset. This exotic tour features the phosphorescent mating ritual of male and female worms floating on the surface of the sea. Sun Charters is a diversion for vacationers flocking to Providenciales’ Grace Bay Beach, a destination commonly ranked as the most beautiful beach in the Caribbean. When these beachcombers get restless and wish to see one of the other islands and cays making up the Turks & Caicos chain, that’s when they turn to Douglas and his crew. What many of these remote islands lack in refinement, they make up for in sheer beauty. Enter the words “most beautiful private Caribbean island” into a search engine and this is exactly what Atabeyra passengers experience during their snorkeling tour. The passengers feverishly shot photos of the congenial JoJo until he submerged after 10 minutes of frolicking. Junior felt this close encounter was reason to celebrate. He suggested that the best way to honor JoJo’s appearance was by sipping an orange rum concoction he referred to as Happy Juice. After another five minutes of sailing, Captain Tibi anchored the boat and explained the ground rules for an hour of optimum snorkeling. Passengers who chose to plunge into the crystal clear sea witnessed a wealth of coral and fish particular to this region of the Caribbean. When the snorkelers hoisted themselves back on deck, Tibi explained that the Atabeyra’s next stop would be Pine Cay. Located about 30 minutes by boat from Providenciales, this private island of powder white beaches and calm turquoise waters is home to The Meridian Club, a 13-room resort, and 38 private homes. We luxuriated for an hour in Pine Cay’s shallow waters. This serene departure could best be described as paradise found. On the way back to Atabeyra’s home port at The Blue Haven Resort and Marina, it was time for the passengers to reflect. You didn’t need Happy Juice to keep from smiling after a relaxing day of sailing, a JoJo sighting, and a wonderful escape to the shores of Pine Cay. Around 4:00 in the afternoon, the Atabeyra docked, and passengers who began the day as strangers ended their journey as friends. As the last guest stepped upon the Blue Haven dock, the 1970s disco song “Good Times” played softly from the Atabeyra sound system. If you’re ever asked to sail on a rum runner in the Turks & Caicos Islands, you’ll be missing a good time if you say anything but “yes.” How many opportunities do you get to star in a scene that usually headlines Johnny Depp? Tim Cotroneo is a freelance writer specializing in Caribbean travel, business, and golf. Visit www.timcotroneo.com.